What a summer! This is a tricky time of year for me though; my twin obsessions collide, the rock climber wanting the great weather to go on forever, the forager getting very excited about the mushroom season. So, on the cusp of these two wonderful past times, I find it best to ignore them both for a couple of weeks and concentrate on the abundance (this years most overused word) of wild and not so wild fruit that the sweltering summer, has delivered to us. 2012 was quite literally, a wash out, but this year’s wet start and super sunny July and August have sent the fruit trees and bushes into overdrive. High on the picking list are…..Crab Apples, Rowan Berries (never seen so many or so big), Apples and Pears (wild and otherwise), Medlars, Mulberries (having an amazing year), Hawthorn Berries and Sloes. Plums have not had a great season, or at least the ones I’ve seen, but the two top crops I’d like to discuss here are both out in force; my two favourites…. Rose Hips and Elder Berries. I never tire of expounding the health virtues of these two and I do want to concentrate on the recipes, but first, a quick look at some of the reasons to eat as many of these as you can, not forgetting the fact that they taste bloody lovely. 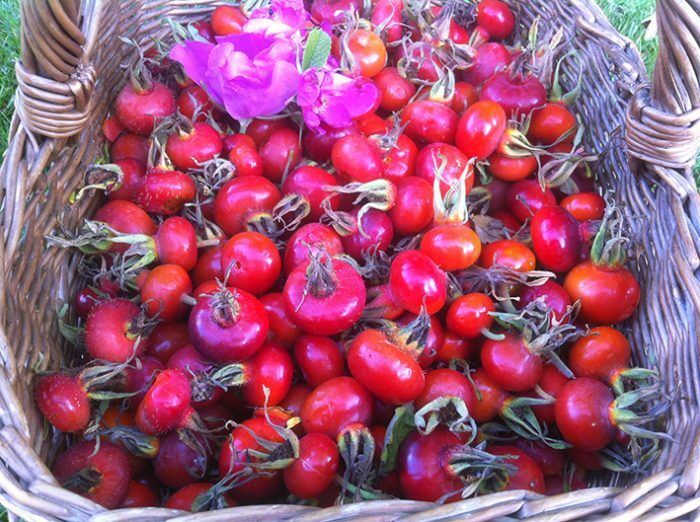 Weight for weight, rose hips contain 20 times the vitamin C of oranges, masses of pectin which aides detoxification, helps treat bowel problems and acts as a demuculent (common in throat lozenges). Used in the UK as a vital source of vitamin C during WWII , roses also contain high levels of anti oxidants, Vitamin A and B and essential fatty acids. It’s not often that Pharmaceutical and Herbal medicine are in complete agreement but they are when it comes to Elder Berries. Clinically proven to combat the effects of flu, not only a great natural anti viral but also an anti inflammatory; If that’s not enough they’re also a diuretic and a decongestant, in other words pretty much everything you need to fight a winter cold. So, enough about their medicinal majesty….how to make something tasty. Most of these recipes originated with far more sugar, from a time without refrigeration so needing it as a preservative; my versions are about dialling down the sugar content as much as possible, often freezing what I make in plastic bottles, leaving the option to add more sugar or other sweeteners later on. I hope you get to make at least one of these simple and thoroughly rewarding little recipes. 1. Elder and Clove Cordial ( my absolute favourite). I say it’s a cordial but it tastes so good that I have never managed to dilute it, instead I drink a neat shot every day throughout the winter. Medicinal properties aside, the joy of knocking back such a tasty treat every day is a fabulous winter tonic in itself. 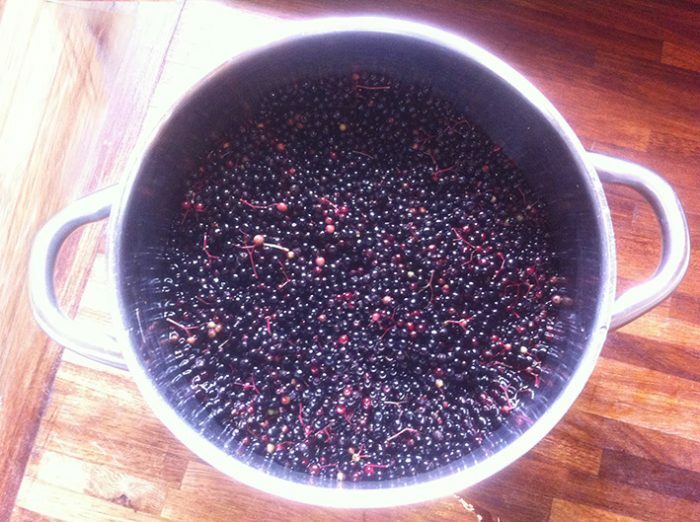 Gather a basket of Elderberry sprays and remove the berries with a fork, dropping them into lots of cold water. Any red or green berries, or any shrivelled ones will float while the ripe ones will sink (TOP TIP, you heard it here first). Simmer them for 20 minutes in enough water to cover them plus another couple of inches for good measure. Strain the lot through muslin and wring it out to get as much juice as possible. Discard the fruit before adding about 500g of sugar for every litre of liquid, bringing it to the boil and simmering for another few minutes. Bottle in sterilised bottles adding 15-20 cloves per bottle. Ready in a couple of weeks but gets better and better as time passes and the cloves infuse. Keep some in the fridge and freeze the rest. Due to their impressive size, I prefer to use Japanese Rose hips (not a native but thoroughly naturalised) but any variety, wild or otherwise wild do perfectly well and different types will give varying flavours. Cook a kilo of hips in about 1.5 litres of water for 20 minutes. While they are cooking, smash them up with a potato masher then strain them through a doubled muslin (important it’s doubled to avoid any of the fine hairs, from the centre of the hip, getting into the mix), then get your rubber gloves on to squeeze out every last drop of the liquid. Take the squashed fruit mass and add another 1.5 litres of water and repeat the process before adding both sets of liquid together. At this point, many recipes recommend adding literally kilos of sugar but I would suggest about 4-500g , heating the liquid until the sugar dissolves. Taste it; if you want more sugar then add it, then bottle some in sterilised glass bottlers for the fridge and the rest in plastic bottles for the freezer. It keeps forever or I assume it does as mine never sticks around for long. 3. 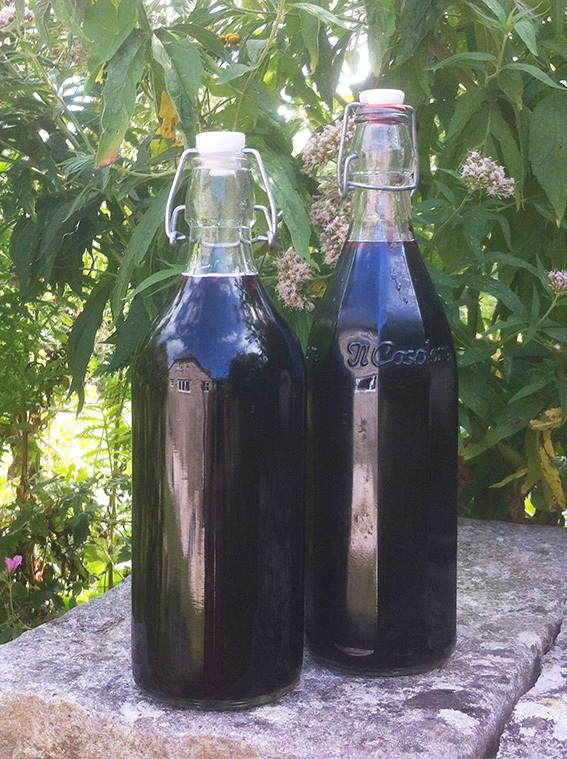 Elderberry Vinegar ( more a sweet sharp syrup actually). This recipe has been through many hands and numerous changes and my version is still very sweet using far less sugar than recommended, although were you to up the sugar content, something similar to a balsamic glaze would result, which could be fabulous on meat as well as salads, so maybe have a bit of a play with different amounts. I use a litre of white wine vinegar combined with 7-800g of Elderberries, removed from their stems using the method above, and left in a large jar for 5 or 6 days. Strain the liquid and discard the berries before adding 800g of sugar (or more ,or less) and simmering for ten minutes before bottling. The flavour of this vinegar is truly astonishing. I challenge you not to like it! 4. A mixed fruit drink or cordial or syrup ( you decide). I invented this last year having picked just a handful of various wild fruits for a photo and having not enough of anything to really make something specific. This is the ideal recipe for the city forager so take a wander through your local park or common and come back with just a small handful of any or all of the following berries or fruits; rowan, plum, sloe, hawthorn, medlar, quince, crab apples, pears, rose hips, elderberries,mulberries and blackberries. With enough water to cover them, cook for 15-20 minutes with a stick of cinnamon, a couple of cloves, 2 or 3 star anise and a little sugar , honey or Xylitol . 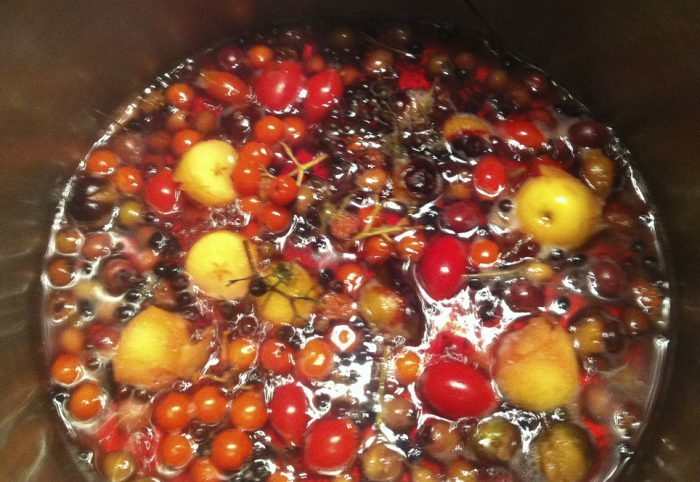 Strain, cool and use as a delicious wild fruit drink, mixed half and half with cold fizzy water. Or, add more sweetener after and make a cordial, even more and you have a syrup. Last but by no means least, this simple recipe produces a lovely tasting dressing for salads and looks great in a clear glass bottle. For this I use smaller hips than the Japanese variety recommended earlier, picked when bright red and ripe, then topped and tailed before having lots of little holes stuck in them with a pin. Be sure not to cause any damage that will let the little hairs from the centre escape. You can also freeze and defrost them to soften them if you like. Find an attractive clear glass bottle, fill it with the hips then fill the remaining space with white wine vinegar or for a sweeter version heat a heaped table spoon or two of sugar for every 100ml of vinegar and leave it to cool before adding it. 6-8 weeks later and its ready to use and in the meantime make sure you leave it sitting around where people can admire you creativity. When I was a child in Ireland many moons ago we used to collect rose hips for charity to be made into syrup and sent overseas to poor countries! When I was a kid mum gave me teaspoon of rosehip syrup every day to ward off colds etc. delicious is my memory of it!!!! I add a few ml of vodka to rosehip syrup as this prevents it developing any mould. Also adds a a slight kick which is just delicious in tonic water.YUM! Next post: I BLOODY LOVE MUSHROOM HUNTING (PART 2). Previous post: The coast is calling to me…and you.